Activated Alumina as Industrial Adsorbent performs well as Defluoridizer with High mechanical strength, and strong hygroscopicity. This product has number of pores and high activity which is good at managing high fluorine water and easy to beregenerated with less interferent. 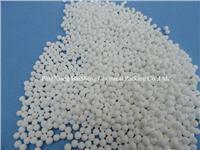 The active alumina is used in the defluridation of drinking water, besides, it can be used as adsorbent, desiccant, and catalyst carrier. 1) High mechanical strength, and strong hygroscopicity. 2) not bulge and crack in water sucking. 3) Non-toxic, odourless, and insoluble in water. 4) It has strong adsorption capacity to fluorine. 1) Dehydration for air, natural gas, cracked gas oil. 3) Catalyst and adsorbent for hydrogen peroxide solution by anthraquinone process.